ILRI deputy director general Iain Wright gave a keynote speech at Tanzania’s first National Livestock Expo and Milk Week, held in Arusha, 31 May to 1 Jun 2018. (photo credit: ILRI/David Aronson). 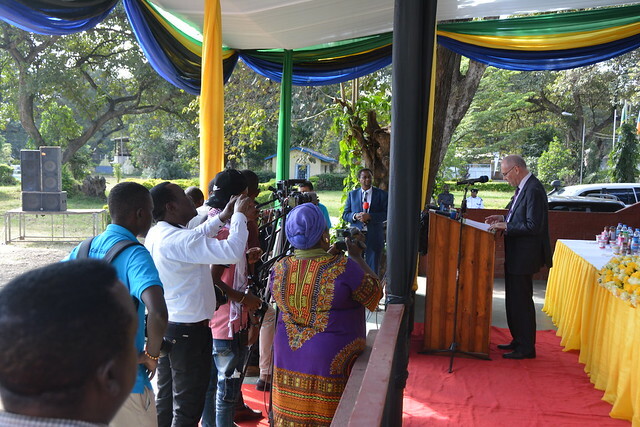 Iain Wright, ILRI’s deputy director general for Research and Development, gave the keynote address at Tanzania’s first National Livestock Fair held in Arusha, Tanzania on May 30, 2018. The fair was organized under the auspices of the Agricultural Council of Tanzania (ACT) in collaboration with Tanzania Dairy Board (TDB) and TANTRADE, with the support of the Ministry of Agriculture, Livestock and Fisheries (MALF). The expo ran from May 29 to June 1, and was timed to overlap with World Milk Day, established by the Food and Agriculture Organization (FAO) to recognize the importance of milk as a global food, which has been held on June 1 every year since 2001. Despite having one of the largest cattle populations in Africa, Tanzania has struggled in recent years to fulfill the sector’s potential. Livestock contributes 7% to Tanzania’s total GDP, and constitutes just 13% of the country’s agricultural GDP. These numbers are relatively low. Some comparisons: Kenyan livestock contributes 12% to the country’s GDP and constitutes 42% of its agricultural GDP. And while dairy contributes just 1.5% to Tanzania’s GDP, Kenyan dairy, with 18 million cows—some 10 million fewer than Tanzania—contributes 8% to that country’s larger overall GDP. . . .